Blessed William was one of the eighteen Carthusian Martyrs of London. All but two of them resided at their Charterhouse Monastery in Smithfield. The Carthusian’s were an enclosed Order of Monks, founded by St Bruno of Cologne in 1084. They lived an austere and withdrawn life of contemplation and prayer. During the 16th Century English Reformation, England broke away from the Authority of Rome and Papal Rule, and King Henry VIII planned to divorce Catherine of Aragon and marry Anne Boleyn. However, at the same time, the Government also wished to maintain the support of the highly respected Carthusian Order. This was not to be, the Monks refused to deny their faith and Religious beliefs. 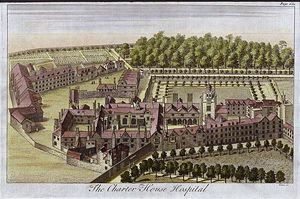 Thus a long process of persecution and attrition began before the Charterhouse was dissolved. On 4 May 1535, the first group of leading Carthusians were executed at Tyburn, London (John Houghton -Prior of London, Robert Lawrence -Prior of Beauvale, Augustine Webster -Prior of Axholme). On 11th May 1537, two Monks (John Rochester and James Walworth) were hanged in chains from the City of York battlements. Between 6th June and 20th September 1537, a further nine Monks and Lay-brothers were starved to death at Newgate Prison, London. They included Bl. William Greenwood who died on the 6th of June. On 4th August 1540, a final Lay-brother was hanged, disembowelled and quartered at Tyburn, London. Blessed William’s Feast Day is the 16th June. Pray for us that we will stand firm to the teachings of Jesus Christ.